CURT 5TH WHEEL/GOOSNECK - The Topper Shop Inc.
Just because you install 5th wheel brackets and rails in your truck bed does not mean your truck is limited to one type of towing. To give your truck the tools it needs to be the ultimate towing machine, CURT offers a gooseneck adapter for a 5th wheel setup. The CURT E16 5th wheel trailer hitch is an economical choice that offers many of the same features found in our Q-Series 5th wheel hitches. The E16 has a gross trailer weight rating of 16,000 lbs. and can withstand a vertical load up to 4,000 lbs. It comes with a dual-pivoting head, 10 degrees of lateral movement and an anti-rattle skid plate to provide a smoother, quieter ride. The E16 also comes with easy, single-handle operation and a durable carbide powder coat for long-lasting protection against the elements. With four height adjustment settings, the E16 is quick and simple to install, and it is backed by a five-year limited warranty. 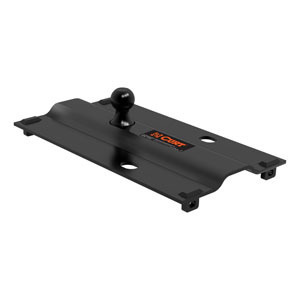 This 16K 5th wheel hitch comes with a set of standard 5th wheel legs that are ready to mount into your truck bed with a pair 5th wheel rails and brackets. 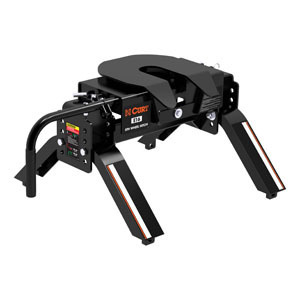 A CURT 5th wheel trailer hitch is the ultimate combination of towing power and smooth driving, but a CURT 5th wheel mounted on a 5th wheel roller turns this gentle giant into the ultimate in mobility too. If you have a short-bed truck, it can be difficult towing a large RV trailer, especially one with an extended front overhang. Around those tight corners, the front of the RV can come too close for comfort to the back of your truck cab. 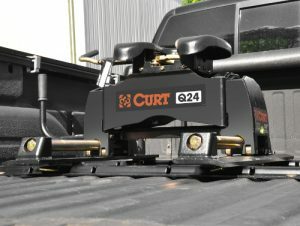 When you are towing a 5th wheel with a 6-foot truck bed, give yourself a little breathing room with a CURT 5th wheel roller.